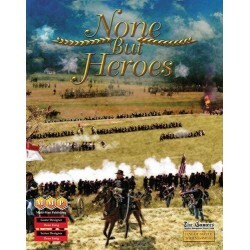 None But Heroes est le premier jeu de la nouvelle série guerre de sécession Line of Battle qui succède à la fameuse série ACW. Une valeur sure pour les amateurs de la période. In September of 1862, after months of uninterrupted and spectacular successes, Robert E. Lee's Army of Northern Virginia was poised to win the war. Lee has beaten back McClellan's Army of the Potomac from the gates of Richmond, routed Pope's Army of Virginia, and built a reputation of invincibility. Meanwhile, Lincoln had already penned the Emancipation Proclamation which would recast the war from one of a political disagreement over Federal control to a moral crusade which just could not be argued away. He just needed a victory to cast the entire war in an a new strategic light. All could very well be decided by what happens in the western part of Maryland over a few days. McClellan fought Lee's army back to the banks of the Antietam creek near the town of Sharpsburg. There both armies stood to fight the bloodiest single day battle in American history. The final decision is in your hands. None but Heroes is a game about that terrible day. Players tackle each other head-on. Can you do better than McClellan? Can you fight McClellan off like Lee? The stakes couldn't be higher! 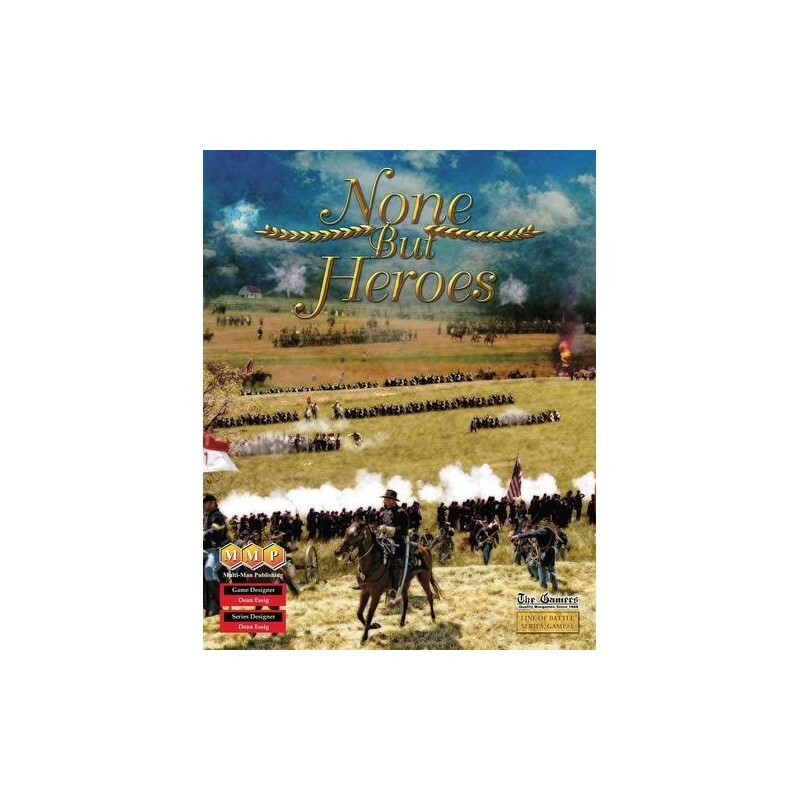 None but Heroes is the first game in the new Line of Battle Series. While drawing on the lessons of over 20 years of ACW design work of its two ancestor series, LoB represents the next generation of ACW game design. No stone was left unturned in making this system the best gaming experience possible. All the unit rosters and paperwork that interfered with the fighting is gone. The typical (and time consuming) multiple fire phases have all been integrated into movement so the action is non-stop. For the first time, the rat fight feel of the ACW open battlefield comes alive. The historical units (generally regiments of infantry and batteries of cannon) actually show the combined arms interactions and tactics available at the time. Old hands will see the history in a new light as they explore the implications of more recent research. 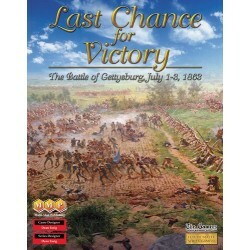 Representing many years of original research, the game contains information not available anywhere else regarding the strength, equipment, location, capabilities, and order of battle of both armies. Extensive historical notes layout just some of the myriad of details included in the units, scenarios, and map. As one small example, it explores the frequently overlooked "Green" units at the battle (units which have been in the army for a few weeks or even less). The Green units will make you look at McClellan's strength in a whole new way. This is a level of "greenness" well beyond the usual sense of "not having been in combat, yet". These are enthusiastic men, but some of whom have not yet been taught to load their muskets. The Union player is only mildly inhibited by his McClellan persona; you can try a lot of different approaches to cutting the Rebels down to size. You are equipped with the same heavy guns and infantry with just as much grit and determination as he was. The Confederate player will need to use his thin forces wisely, but cannot fail to counterattack as needed to blunt Union advances. You must use your troop's elan to make up for their limited numbers. The game features four two-map scenarios which allow players to pick up the action at various times during the day and the morning of the next. The ability to start play the day after the battle allows players a chance to explore the options available on that day. Each of the other three scenarios can alternatively be played as a two day campaign game. In addition to the large scenarios above, there are four smaller scenarios involving only portions of one map. One is a very short learning scenario showing the charge of Hood's Texans into the Cornfield. The other three isolate key actions of the battle: The compete Cornfield fight, the Battle for the Sunken Road, and the final attack by Burnside to take Sharpsburg and the counterattack by A.P. Hill's Division.